A local councilman proposed the idea of implanting microchips in criminals on house arrest—even if they are nonviolent offenders. 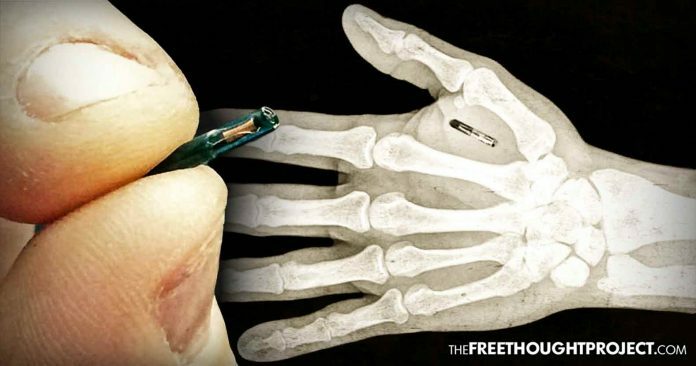 Toledo, Ohio – This Tuesday, Toledo City Councilman Rob Ludeman suggested that criminals be implanted with microchips so they can be tracked by police and the courts. Ludeman also made comments essentially describing people charged with crimes as animals. Ludeman suggested that implantable microchips should be used instead of ankle bracelets for people doing time on house arrest because ankle bracelets don’t work on the cop shows that he watches. “I’ve seen enough shows on TV where the individual has slipped it off and they’ll go commit a crime and slip it back on. I can’t believe it’s an inhumane thing and I’ve got to believe the technology is there. We microchip our dogs, cats, there’s got to be a way that you can put a microchip in and it can’t be removed until their sentence is served or probation is over,” Ludeman said, according to the Toledo Blade. Luckily, other members of the city council did not immediately jump on board with the plan, but they weren’t extremely repulsed or offended by it either. “It’s something I’d have to look into. We don’t want to be Big Brother. What we want to do is make sure people are where they say they’re going to be,” Councilman Gary Johnson said. Councilman Nick Komives defended Ludeman, saying that he did not intend for his comments to be harmful. Komives went on to say that there are “probably” ethical problems with implanting microchips into prisoners and parolees. “As a concept, I am not particularly in favor of microchipping human beings. We might find it humane for dogs because they run off, but I think there are probably a lot of moral and ethical questions that would come to mind when thinking of microchipping humans.,” Komives said. According to Deputy Court Administrator Burma Stewart, electronic monitoring is used on an increasing number of people, but the vast majority of them are non-violent offenders. Stewart also said that there have only been two attempted escapes in the past year and both of them were quickly apprehended. Councilman Tom Waniewski seemed to be in favor of these types of measures to prevent drug dealers from making sales while on house arrest. “They’re getting to the point where they are thumbing their noses at us. The police do too hard of a job to have them back in the community. It’s not fair to the residents. Boy, if there was a way that these ankle bracelets could do more than just monitor, I’d ask you to order a couple dozen more,” he said. The fact that RFID chips have been known to cause cancer when implanted in humans was not brought up at the meeting. According to research funded by the National Institute of Justice, prisoners who are released with electronic monitoring have a far lower recidivism rate than those who stay in jail for their full sentence. There seems to be a fair amount of pushback that will hopefully prevent this from becoming a reality in Ohio anytime soon, but the fact that this even a conversation taking place at city council meetings is extremely alarming. In 2004, the FDA approved the implantation of RFID microchips in humans, and while they are not widely used, there has been talk of them being used on soldiers, and one company in Wisconsin is forcing their employees to get chipped in order to access company computers and fulfill daily activities.